* Member of ABPI, ABAPI, AIPPI, INTA, LESI, ASIPI, ECTA. Law Degree – Faculty of Law of the State University of Rio de Janeiro, UERJ (1985). Master’s Degree in Comparative Law – George Washington University Law School (1987). Consultant for the Industrial Property Division Geneva, Switzerland (1989-1990), World Intellectual Property Organization – WIPO. Member (since 1993), Third Vice-President (1998-1999), First Vice-President (2000-2003) and President (2004-2007) of the Brazilian Association of Intellectual Property – ABPI. Permanent member of the Board of Directors of ABPI. President of the Brazilian Group (2004-2007) and Member of the Q94 Committee (World Trade Organization) of the Association Internationale pour la Protection de la Propriété Intellectuelle – AIPPI. First Vice-President (2004-2006) of the Inter-American Association of Intellectual Property – ASIPI. Member of the National Council Against Piracy and Intellectual Property Infringements of the Ministry of Justice (2005-2007). 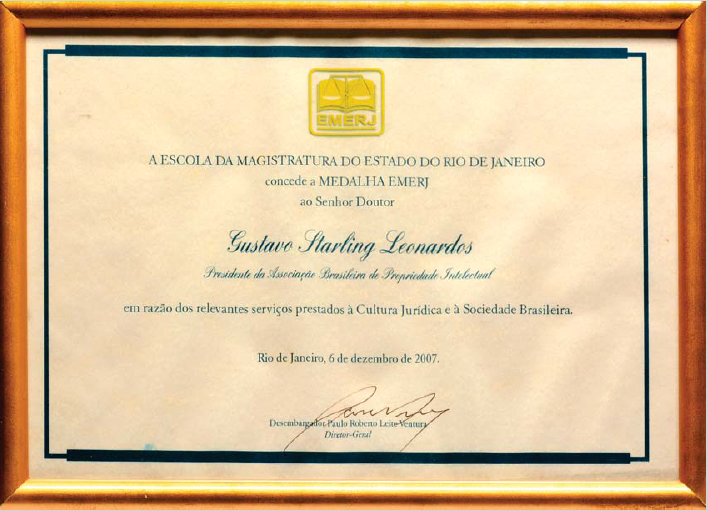 Awarded with the School of Magistrates of the State of Rio de Janeiro (EMERJ) Medal in 2007, for the outstanding services rendered to the Legal Culture and to the Brazilian Society.